Testing over folks, the Xiaomi Mi Note is getting the Android 6.0 Marshmallow update soon - should be tomorrow! The Developer Edition already received the update and it’s firmware version MRA58K. 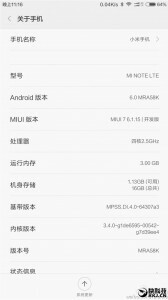 The MIUI interface is at version 7, no surprises here. Keep in mind that this is for the Xiaomi Mi Note, not the Note Pro. Me too,also nv get 6.0,check wit dem said wait. Also for the Xiao mi mi note said got 6.0 yestdy,I try alsodun hv. Whu ever do this wan go n get thing done all first.